Sunday night after we went parasailing, we ran back to the hotel, quickly changed clothes and went to dinner. Everyone was waiting at the hotel for us because we didn’t even go out to parasail until 5:15, but they didn’t mind, or that’s what I keep telling myself. :). We decided we’d take the suggestion of Peg Leg Pete’s that everyone said, YOU NEED TO TRY, but they were packed. With our party of 9 it would have been at least an hour and a half wait. 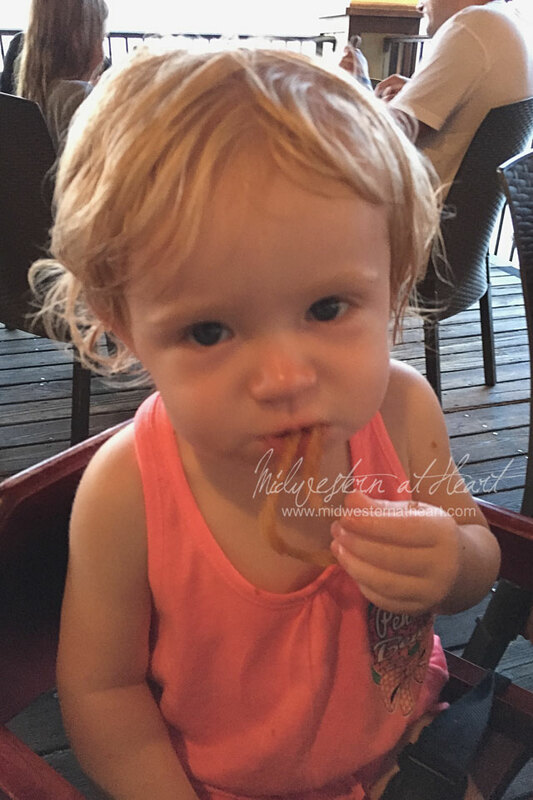 We didn’t want to do that, especially not with a one year old so we threw out the suggestion of Hemingway’s Island Grill. Initially my mom didn’t want to go there because she figured it was like the one in Springfield, but when I looked up the menu it was obvious that it was nothing like the restaurant in Springfield. So we were sold. Especially since we got there and they were able to immediately seat our party of 9. We decided to start with Mary’s Onion Spirals. 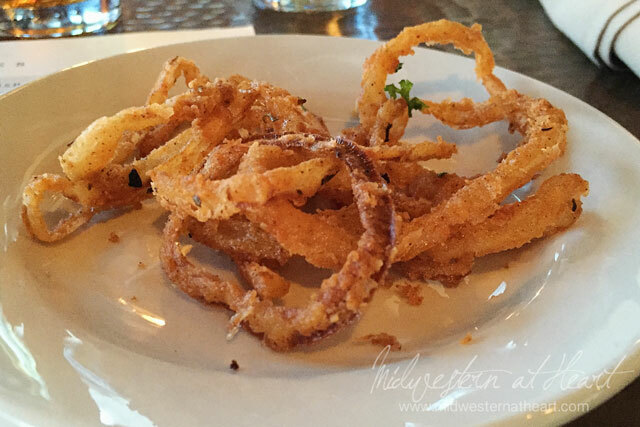 Fresh thin-sliced onions, hand-breaded and deep-fried, served with our key lime mustard sauce. 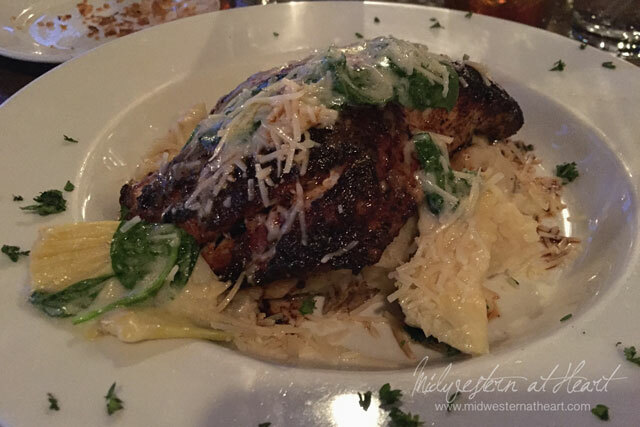 Make your selection extra special with the selection of: Florentine Style – Char-grilled fish selection topped with a spinach artichoke sauce and Feta cheese over garlic smashed potatoes. That option just sounded really good so after talking to dad and hubby about what type of fish to get and how to get it cooked, I went for it. And might I say… YUM! I ate all but the two bites I shared, one with hubby, one with dad. I made them try what they helped me select. Hubby and dad went with the special. 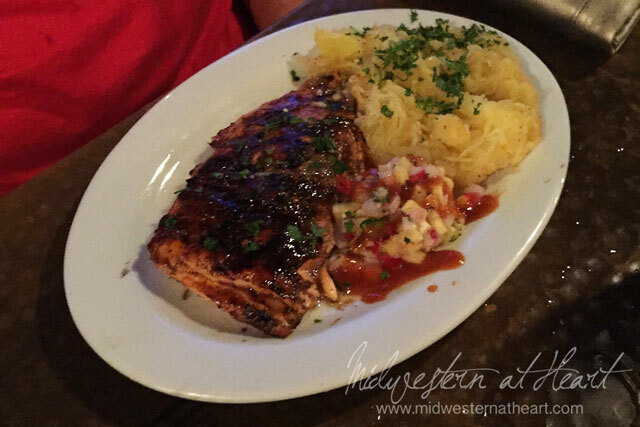 It was called Red Snapper Olé. It wasn’t on the menu, it was a special. 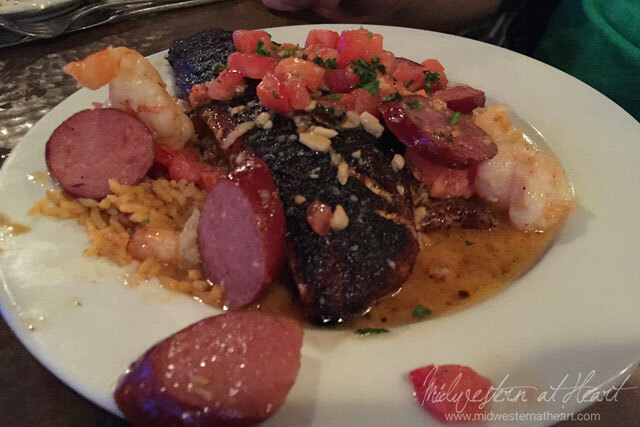 It was Red snapper, shrimp, andouille sausage over rice with a garlic butter cream sauce. In the words of hubby this meal was freakin amazing. Top 5 best things he’s ever eaten in his life. And we’ve had some pretty darn good food. Tbug & Memaw went with the Tri-colored cheese tortellini and Shrimp. 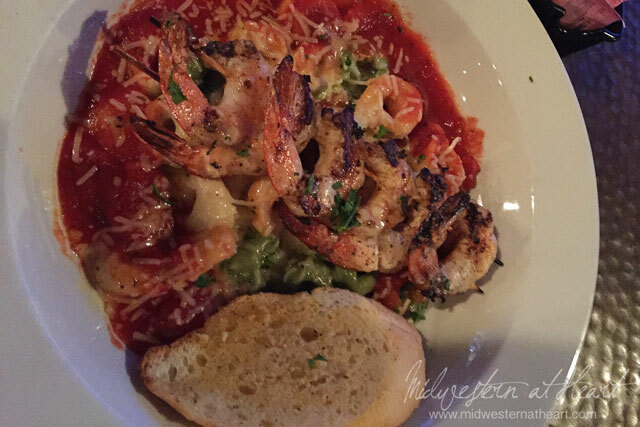 Cheese stuffed tortellini tossed in alfredo sauce and placed atop marinara sauce with 5 grilled shrimp. She was all excited when they gave her 6 shrimp. She enjoyed this so much that she ate every last bite, well except for the bread. She’s crazy, she doesn’t always eat garlic bread. Grandma went with Papas fish sandwich. 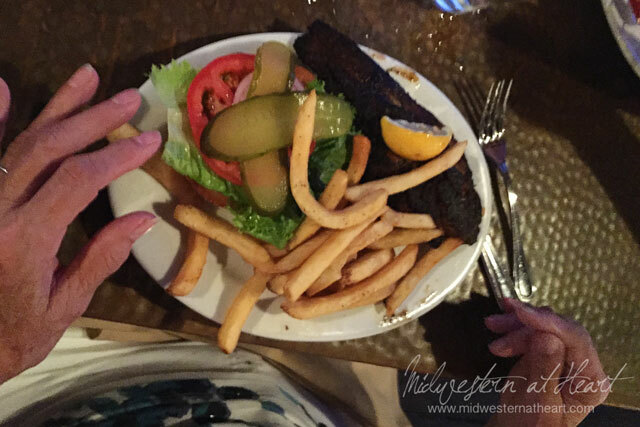 Caribbean spiced fish filet grilled, fried or blackened with lettuce, tomato and onion on a fresh toasted kaiser roll. Mom did the Fish selection as well but went with Red Snapper. She substituted short story squash for her side. So this was a last minute dinner menu change and it turned out to be the restaurant that all the meals of the trip were compared to. Does that tell you something about this restaurant. I’m not kidding, everyone compared the meals to this particular restaurant. In fact, we’re still talking about this restaurant. ha!